Like its former Soviet neighbors, Turkmenistan craves international attention, but is rarely gratified by the results. Unlike regular people in Turkmenistan, the ruling family is getting to do a lot of traveling these days. Serdar Berdymukhamedov, the president’s son and deputy foreign minister, had a particularly busy week. Turkmenistan’s Foreign Ministry reported on July 3 that he met with a suite of top officials from international bodies, including the secretary-general of the Organization for Security and Cooperation in European and the United Nations deputy secretary-general, over a span of 48 hours in Vienna. The younger Berdymukhamedov then spent the next two days in Geneva in seemingly bland diplomatic consultations with UN officials and representatives of international organizations. There was also time for more frivolous business. The Turkmen delegation travelled to Aigle, a small Swiss town of 10,000 people in the foothills of the Alps that would be anonymous but for it being the home to the Union Cycliste Internationale. One of Turkmenistan’s main priorities on the global scene these days is to persuade the world cycling body to give it hosting rights for some attention-grabbing sporting event or other. They may be pushing at an open door with UCI president David Lappartient, who recently wrote a letter of gratitude to bicycle-loving President Gurbanguly Berdymukhamedov for promoting the sport in his country. (Incidentally, sources in Turkmenistan inform Eurasianet that many of the state officials who participated in the record-beating mass bicycle outing in June were forced to buy the bikes with their own money. This suggests Lappartient is in effect endorsing authoritarian practices). The elder Berdymukhamedov this week set something of a notable precedent by succumbing to a whim and extending his visit to the Russian republic of Tatarstan to catch a World Cup quarterfinal match in Kazan. Chronicles of Turkmenistan, an exile-run outlet critical of the regime, highlighted the fact that one of Berdymukhamedov’s grandsons, Kerimguly, was also present at the Belgium-Brazil game. The official reason for Berdymukhamedov being in Russia was a meeting with Tatar President Rustam Minnikhanov. Conversation also included talk of developing Tatar-Turkmen ties in education. But no mention was made, needless to say, of the plight of Turkmen students who have been unable to transfer funds to Russia to pay for their education. According to the foreign-based Alternative News of Turkmenistan and RFE/RL’s Turkmen service, Azatlyk, students are being pressured to come home and even inform on other students. Given the weather back home, it is hardly surprising the ruling family is seizing any chance to take a break. Temperatures in Ashgabat have hovered around 38 degrees Celsius (104 Fahrenheit) over the past week. Azatlyk reported on July 2 the temperature was as high as 47 degrees Celsius (117 Fahrenheit) in the shade. Other Turkmen government ministers may also soon get a chance to escape Ashgabat’s heat now that Berdymukhamedov has granted them permission to take leave from July 9 until July 23 in a speech to the cabinet reported by TDH. The way the president sets holiday times for ministers and his insistence they rest in domestic sanatoria is just another illustration of his oppressively micro-managerial style. Possibly caving to rising indignation, there is some sign authorities are loosening the draconian travel restrictions slapped on regular citizens. Chronicles of Turkmenistan reported on July 9, for example, that relatively few citizens are now being barred from traveling. The Alternative News of Turkmenistan outlet, meanwhile, published an article claiming that while demand for Turkmen passports has spiked, there have been extreme delays in issuing the documents. Like its former Soviet neighbors, Turkmenistan craves international attention, but is rarely gratified by the result when it gets it. In a rare item of coverage by a major title, The Economist in its July 5 edition dwelled on the ongoing economic crisis in a piece titled “Turkmenezuela,” a mocking reference to the hydrocarbon-reliant Latin American basket-case whose decline bears passing similarities with Turkmenistan’s plight. The most eye-catching detail in the short article pointed out how figures from the Bank for International Settlements show that $23 billion from Turkmenistan has accumulated in accounts in Germany. These funds have long been the subject of speculation. Deutsche Bank, where the money is reportedly held, has refused to divulge any details on the holdings, although it is strongly suspected they were salted away there by Berdymukhamedov’s predecessor, Saparmurat Niyazov. Berdymukhamedov has obliquely probed at and queried these vast holdings but it is uncertain whether he or his acolytes have managed to get their mitts on the cash. 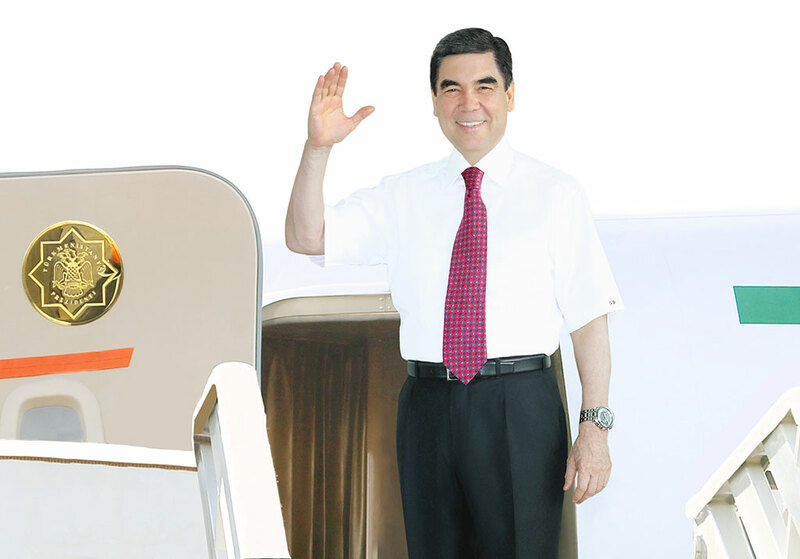 The sense of mystery has only been deepened by talk of three flights being undertaken by the Turkmen presidential aircraft to Germany in June. With only scant details to work with, some speculate the flights are to do with this bank account business. Others suggest Berdymukhamedov is shuttling his ailing father to Germany for medical treatment. It is hardly news that Turkmenistan needs the cash. But every week that passes reveals some new awkward and embarrassing liability. On July 2, Belarusian-focused and Polish state-funded new outlet Belsat claimed that Ashgabat still owes Belarus about 85 million Belarusian rubles ($43 million). These debts are related to construction work at the Garlyk potash plant, which opened last March and was built by Belarusian contractors at a cost of around $1 billion. It so happens that Garlyk is in the news back in Turkmenistan too. Reporting on the July 5 Cabinet meeting, the TDH state news agency claimed that output at the plant has exceed plans. The same article much further down revealed, however, that the former head of the state chemicals enterprise Turkmenkhimiya, Durdy Ashirmammedov, who was fired in May, was under investigation for taking bribes from unspecified foreign companies to arrange the sales of chemical fertilizer. Joining the dots is hard in the absence of detail, but it is obvious something has long been festering in this area. It also all spells ominous times for the Garabogaz ammonia and urea plant, which was contracted to Japan’s Mitsubishi and Turkey’s Çalık Holding. The plant had been expected to be completed this month, but progress on operations is unknown. In a rare tacit admission of chronic maladministration, the government has moved to create a body called the Office of Public Utilities, which will operate under the aegis of the Construction Ministry. Chronicles of Turkmenistan described this measure as being partly motivated by the mid-May floods that caused extensive damage to basic infrastructure in Ashgabat and elsewhere. Then again, now that Turkmenistan has phased out the generous free allocation of basic utilities like electricity, gas, and water, the creation of such a body may simply reflect the need to create a suitable bureaucratic structure to manage the now-monetized system.